Do you prefer organic vegetables, fresh cut flowers, and tomatoes in middle of the winter? How about color in your backyard — year round? 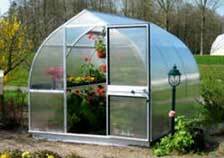 It is all possible with a RIGA greenhouse. The best possible value in its class. The Riga XL Greenhouses The Riga Extra Large Greenhouses–16 mm polycarbonate - is the largest commercial quality hobby-kit type, The Riga Extra Large Greenhouses come standard with Triple Wall Polycarbonate: 10 years – prorated after 5 years. 16 mm UV coated TRIPLE-wall Polycarbonate Glazing, 10 MM twin wall polycarbonate in front & back walls for extra strength Includes: 4 ea. large roof windows: 37.5" W x 39.5" L 2 ea. large Dutch style doors: 37.5" W x 74" H 4 ea. Automatic Roof Openers The Riga XL greenhouse is attractive and beautiful to look at – fits well in to an upscale garden setting !! !